Here’s a list of the scenes in the video: V.S. Band of Scots and Welsh Guard marching into Nathan Phillips Square prior to opening ceremony. V.S. At opening ceremony with Toronto’s Mayor Dennison and Prime Minister Lester B Pearson delivering his opening address. G.V. Thousands of balloons being released. V.S. Pearson walks away, he shakes hands with Alfie Howard and the Town Crier of Lambeth. V.S. 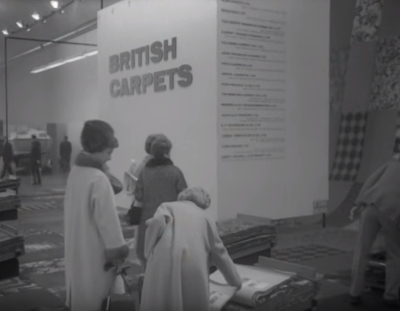 Around exhibition hall showing British carpets and cars including an Aston Martin DB6. V.S. In the London pub a Pearly King and Queen try to get the drinkers to dance. M.S. Alfie Howard the Town Crier in action, next to him is a British policeman. V.S. British clothes, toys and china. If that sentimental memory of good times found you cutting dusty onions, then you’ll be pleased to know the video is on sale here so you can enjoy it time and time again. And that begs the question … when can we have another British Week in Toronto please? This entry was posted in Uncategorized and tagged british pathe, british week in toronto, brits in toronto on November 20, 2015 by britsintoronto.